In 1948 British Railway passenger trains called at just under 7,000 railway stations. Today that number has been reduced to around 2,500. Despite the substantial cuts to the size of the national network and the number of stations over the last 70 years, a remarkable variety of stations still exist. These range from some of the great city centre termini, which in their scale and grandeur can be viewed as the Victorian equivalent of medieval cathedrals, to stations serving small towns and remote country halts. 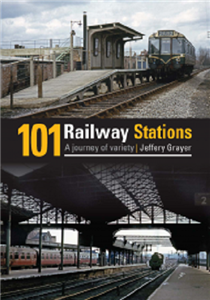 The author has selected 101 examples of the most interesting stations from across the network to show the diversity that still exists among Britain’s stations. The history of each of these is recounted, as is that which makes it special. There are illustrations of stations both historic and contemporary, and also included are modern interpretations of what a railway station should look like.